Chabad House is more than just a huge organization, a cool building and hundreds of programs and services. Chabad is a vibrant community where you, our students, are the central figures. At Chabad we care about enriching every aspect of your college experience, making things easier for you and connecting you with necessary resources. There are so many questions in college, and at Chabad we try to give you the answers. So take a moment and check out the links to fantastic resources on this site. Looking for a ride home or any other location? Looking for a passenger to share the gas expenses and help pass the time? This is the perfect place to find what you need and possibly make some new friends! 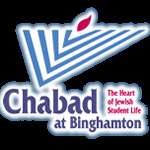 Information on Kosher dining options in Binghamton.